Australia captain Tim Paine won the toss and opted to bat against an injury-hit Sri Lanka in the second and final test on Friday. 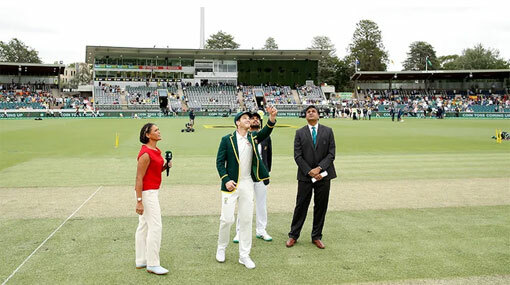 On a chilly and overcast morning at the Manuka Oval, which is making its debut as a test centre, Paine finally had some luck with the coin toss, winning only the second time in nine tests he had led Australia in. “I can’t believe it. I did go with the left hand,” said Paine, who on Thursday had promised to change his technique of tossing the coin. “I was practising in the team room with the boys last night. It’s a nice start. Australia, who lead the series 1-0 after their win in Brisbane by an innings and 40 runs, went in with an unchanged team hoping to bag their first series in over 12 months. Sri Lanka lost all-rounder Angelo Mathews and paceman Nuwan Pradeep to injury before the first test and were forced to go with a completely new pace attack for the second match. After injured pace duo Dushmantha Chameera and Lahiru Kumara returned home after the Gabba test, it was the turn of the experienced Suranga Lakmal to be ruled out due to a stiff back. Lakmal had taken five wickets in Australia’s first innings at the Gabba in the day-night match. Vishwa Fernando and Kasun Rajitha were drafted in while Chamika Karunaratne will make his test debut. Batsman Roshen Silva was replaced by Kusal Perera in the fourth change to the touring side’s team.